OK, so you didn't believe me last week when I told you we're really getting into the heart of the movie season and delivered five new movie reviews. Well, would you believe five more opening today? Or that the legitimate horror show in the bunch might be the most entertaining in a quintet that includes celluloid returns for both Dr. Seuss and Lisbeth Salander, not to mention two fine small movies we ran down at this year's Toronto International Film Festival? Russell gets more than he bargains for in dealing with the dark side of WWII. The bloody and energetic "Overlord," a WWII Nazi/zombie movie with an unheralded director and mostly unknown cast, actually even finds room to mention baseball Hall of Famer Stan Musial among its many surprises. It remains to be seen if the same good things will happen here for Julius Avery, but the director does take a screenplay from Billy Ray ("Captain Phillips," "The Hunger Games") and Mark L. Smith ("The Revenant") and mostly runs full speed ahead with it. That includes the expertly choreographed parachuting of an American squad into a small French village to knock out a well-positioned German stronghold on the eve of D-Day. Certainly the action runs heavy right on through what occurs after their ultimate discovery of the horrifying goings-on in the same building's basement. See it, enjoy it, thank me later, then watch Wyatt Russell (currently on AMC's wacky "Lodge 49") and Jovan Depo (from 2016's "Fences") become major Hollywood players. 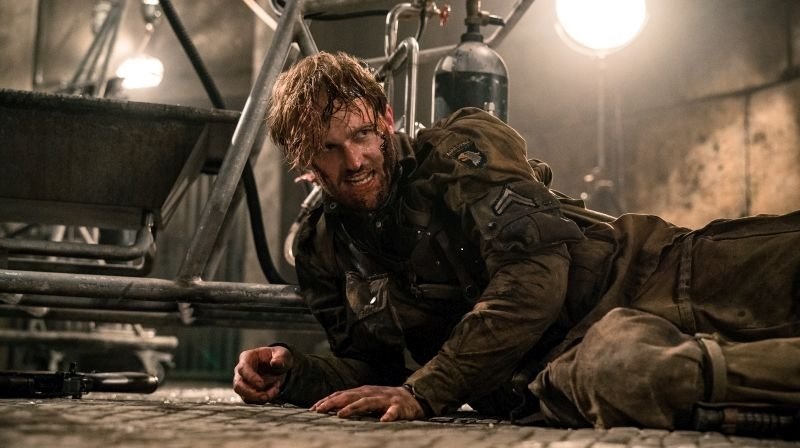 Russell, the son of Kurt Russell and Goldie Hahn, is the initially reluctant squad leader, while the British Depo makes his mark as the often bewildered real hero of the piece. By the way, John Magaro, a busy young actor from Munroe Falls, Ohio, grabs his moments, too, as a talkative (and humorous) G.I. On the other side of movie spectrum, there's the latest animated telling of "The Grinch," which remains strictly for kids until it becomes time for adults to pay attention to the familiar, heartwarming message. As voiced by Benedict Cumberbatch, the titled green grouch lives way up in the mountains above Dr. Seuss' beloved and equally colorful Whoville, where spunky little Cindy Lou (Cameron Seeley) perseveres to do something nice for her valiant single mom (Rashida Jones). Sometimes in rhyme but often not, narrator Pharell Williams helps explain what's going on when Grinch coerces his funny, faithful pup to play along with his silly schemes to spoil the town's joyous season. Of course, there are holiday tunes galore -- a few new ones and many old -- with all gloriously capped off by "The Christmas Song" from the still one-of-a-kind Nat King Cole. And, just who can possibly get grinchy hearing that? Foy does her thing as the hacker/heroine in the latest "Girl" movie. Another grumpy persona returning to the big screen arrives this time as "The Girl in the Spider's Web." Naturally, she's' the aforementioned Lisbeth Salander of "Dragon Tattoo" fame and now played by the grand Claire Foy, who apparently can portray anyone. I mean, she simply was Queen Elizabeth during her award-winning turn on Netflix's "The Crown," Neil Armstrong's solid wife in "First Man," and the surly, unhinged victim she captured in the little-seen "Unsane" very early this year. Actually, the latter role might have prepared her for the Salander shenanigans that have her effortlessly leaping tall buildings in a single bound. Not really, mind you, but this athletic and brilliant character uncorks as many jaw-dropping stunts and mind-twisting head games to match either James Bond or Ethan Hunt, the CIA type that Tom Cruise personifies in the "Mission Impossible" movies. Honestly, there seems like a little too much impossibility in what Lisbeth manages here, including one preposterous escape on a drawbridge. However, despite the film's dark, dreary and sordid content, Foy's efforts could result in Salander continuing to exorcise her demons (and miscreants) again in firm franchise fashion. And, speaking of villains, the ones behind the "Spider" syndicate are oddly effective, too, even if we can see the key builder of their wretched web coming almost two hours earlier. 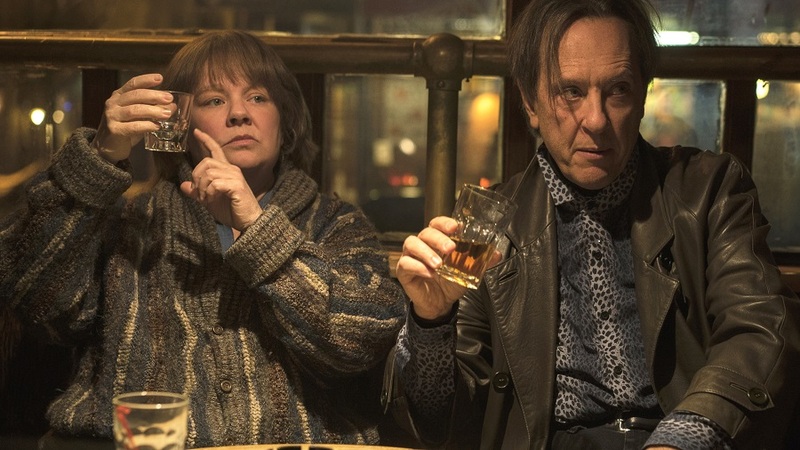 McCarthy and Grant fill 'em up in "Can You Ever Forgive Me?" Finally, those festival films, "Can You Ever Forgive Me?" and "What They Had" (both "R"-rated and worth at least $ $ $ and 1/2 out of $5) feature performances to laugh and cry with in stories that demand attention. The former finds Melissa McCarthy in a role that could be a distant cousin to some of the fools she's played in so many bad comedies, though this one is based on a real person. That would be biographer-turned autograph forger Lee Israel, whose alcoholism led to her losing a job and pulling a rather interesting scam on collectors and parts of the New York literary community. Richard E. Grant, meanwhile, chews up his turn as her homeless partner in crime with the charm of a complete cad and might at least steal away a supporting actor nomination for doing it so auspiciously. Similarly, another longtime character actor, Robert Forster, easily could find himself as one of Grant's main competitors in that category as the caretaker/husband of a woman (Blythe Danner) starting to suffer from Alzheimer's disease in "What They Had." In fact, the entire ensemble, which includes two-time Oscar winner Hilary Swank and double nominee Michael Shannon, as the couple's somewhat dysfunctional children, often soars in this heartbreaking drama from actress-turned writer/director Elizabeth Chomko.